Grace Crum Rollins 95H, who died on August 8 at age ninety-eight, was described as quiet and small in stature but firm in her beliefs, which included helping to fund a building to house Emory’s School of Public Health. In 1994, the Grace Crum Rollins Building became a permanent home for the school, and the family’s generosity led the Rollins School of Public Health to become one of the nation’s premier schools in its field. Grace Crum married the late O. Wayne Rollins, both from rural beginnings, during the Depression. Years later, Forbes magazine would count Wayne Rollins among the nation’s leading businessmen. In what is considered one of the first leveraged buyouts, he bought Orkin Exterminating in 1964. The family business grew to encompass oil and gas services, security systems, and real estate. Wayne and Grace Rollins moved to Atlanta with their sons, Randall and Gary. The couple became involved at Emory through Candler School of Theology and Wayne’s role as a University trustee. With a lead gift to the School of Medicine, they enabled construction of the O. Wayne Rollins Research Center, doubling Emory’s laboratory space. Upon learning that the school of public health needed a building, Rollins voiced his support, but died unexpectedly in 1991. Less than a year later, Grace and her sons fulfilled his interest by contributing $10 million. The family funded the O. Wayne and Grace Crum Rollins Endowment for faculty development and the Center for Public Health Preparedness and Research. 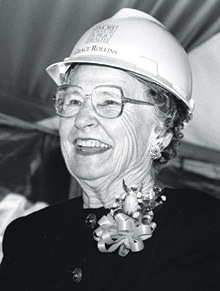 In 2007, the family provided a $50 million lead gift from the O. Wayne Rollins Foundation and Grace Rollins for a second building to be connected to the Grace Crum Rollins Building by a glass corridor. The Claudia Nance Rollins Building, named for Wayne Rollins’s mother, will open in 2010. Grace Rollins is survived by sons Randall and Gary, who have served as Emory trustees; nine grandchildren (the Rollins School of Public Health’s Rita Anne Rollins Room is named for her late granddaughter); and twenty-four great-grandchildren.